If you're looking for ways to eliminate or reduce the sugar content of your favorite recipes, Truvía® is a great option to consider. This popular sugar substitute is made from a combination of stevia leaf extract and erythritol, both of which are natural substances, and natural flavors. While I have long used zero-calorie Truvía®, I only recently became aware of the other items included in the brand's product line. 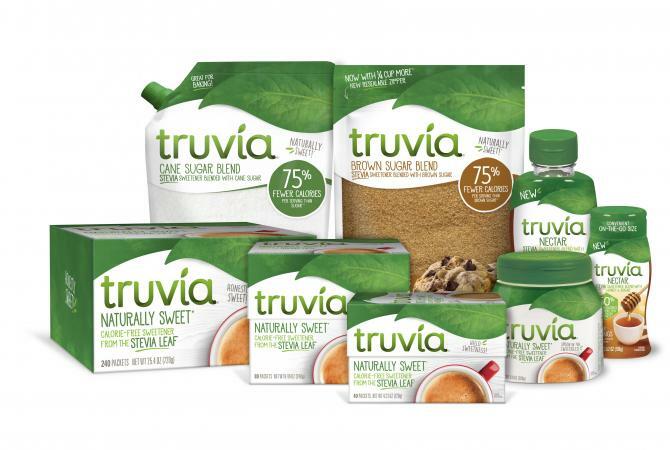 When the Truvía® team sent me a variety of the company's sweeteners to sample for this independent product review, I had an opportunity to learn about their spoonable granular sweetener and the various sugar blend options they offer. The brand's no-calorie sweetener is available in packets and spoonable form. I started using stevia before Truvía® was introduced and really liked it. However, in my experience, the flavor and strength isn't always as consistent with various brands of stevia as when using Truvía®. When I bake carbohydrate controlled goodies (which I do quite often), I prefer Truvía® because of its flavor consistency and the fact that it is easy to substitute it for sugar (half a teaspoon equals one teaspoon of sugar). Plus, I like the flavor of Truvía® and don't find that it has an aftertaste. Packets: I used the packets to make this sugar-free jello recipe using Kool-Aid and unflavored gelatin. It tasted great - even family members who don't watch their sugar intake enjoyed the results. Spoonable: I used the spoonable granular product in place of erythritol in this recipe for low carb frosted pumpkin cookies from Jennifer Eloff. They turned out really well - they tasted great and I will make them again using this sweetener. Of course, these calorie-free sweeteners can also be used to create many additional low carb desserts and diabetic-friendly sweets. The full Truvía® product line also includes two granular sugar blend products and a syrupy-consistency item called Truvía® Nectar. These are good options for those who don't want to completely give up the real thing, but who do want to cut back on calories and carbs. Cane Sugar Blend - You can use this product in most recipes that call for sugar or another type of reduced-calorie or zero-calorie sweetener, from cocktails to coleslaw, as well as (of course!) many kinds of desserts. The only difference is that you would use a half cup for every full cup called for in the recipe you are using. Brown Sugar Blend - The brown sugar blend can also be used in most recipes that call for brown sugar, from baked beans to barbecue sauce. As with the cane sugar blend, you would use a half cup of this product to substitute for a cup of regular brown sugar. Or, you can use a recipe that calls for specifically for this product, such as this apple crumb cake. Truvía® Nectar - This product is intended to be used as a honey substitute. It is a blend of Truvía®, cane sugar and honey. Use it any way you would use actual honey. For example, trying using it to make a batch of your favorite sweet barbecue sauce or honey mustard dressing. Just be sure to use only half the amount of honey listed in the recipe. All of the Truvía® sweeteners are good options for reducing the amount of sugar in your favorite recipes. The zero-calorie products are my personal favorites, but that's because I try to eat as little sugar as possible and am pretty good at preparing sugar-free desserts and sauces. However, for anyone who is looking for a way to gradually start cutting back on full-calorie sugar, the cane sugar blend is a terrific option. There are also some recipes that just really need honey or brown sugar, and these blend options are a great alternative to consider. Note: The author received a selection of free samples from the brand to review. The opinions presented here are her own.